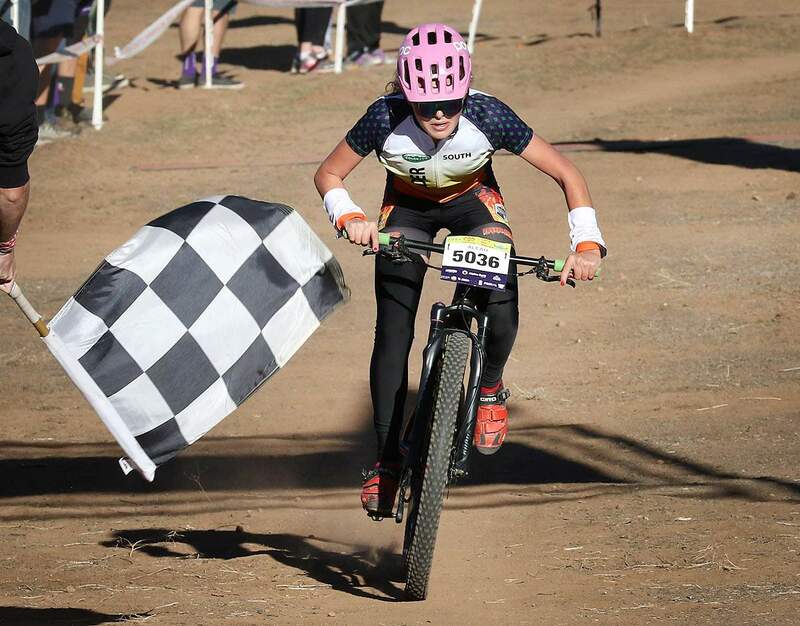 Aleah Austin of Durango High School crosses the finish line to win the sophomore girls Colorado Cycling League state championship on Sunday on Durango Mesa. 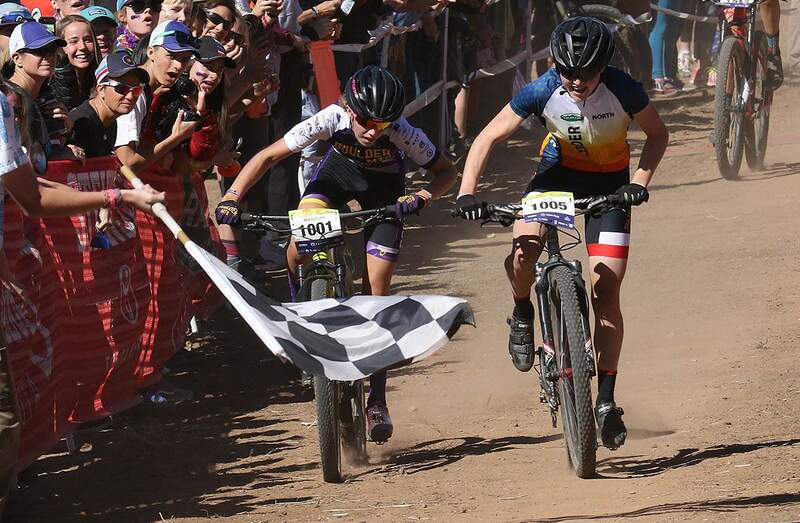 Ada Urist, right, of Fairview High School, beat Madigan Munro of Boulder High School in a sprint to win the varsity girls Colorado Cycling League state championship Sunday on Durango Mesa. Sage Davis of Animas High School rides in the varsity girls Colorado Cycling League state championship on Sunday on Durango Mesa. Davis led early and finished eighth. Sadie Schafer of Animas High School rides in the varsity girls Colorado Cycling League state championship on Sunday on Durango Mesa. Ruth Holcomb of Durango High School rides in the varsity girls race during the Colorado Cycling League state championship on Sunday on Durango Mesa. 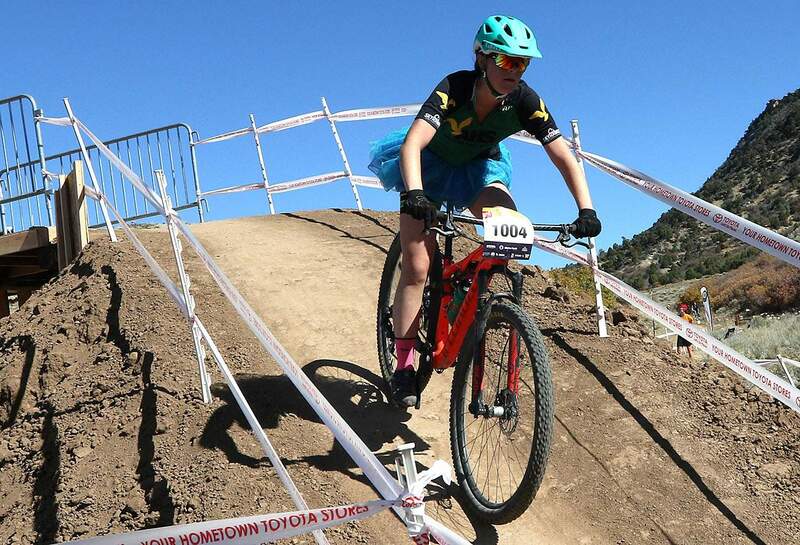 A great mountain bike race ended in protest Sunday during the Colorado High School Cycling League’s varsity girls state championship event. South Conference champion Ruth Holcomb, a sophomore from Durango High School, and North Conference champion Ada Urist, a junior from Boulder’s Fairview High School, were in a group of four that included Boulder junior Madigan Munro and Green Mountain Composite sophomore Sofia Forney at the front of Sunday’s race at Durango Mesa Park. Holcomb made a move going through the underpass at the halfway mark of the third-and-final lap, and she briefly took the lead as the two conference champions exchanged attacks. When the riders came to the finish line, though, it was Urist and Munro who sprinted to the finish with Holcomb a few hundred yards behind. Urist won the sprint and claimed the 21-mile state championship race in 1 hour, 33 minutes, 46.76 seconds, while Munro was second only 0.16 seconds behind. Holcomb rolled through in fourth in 1:34:00.72, but she quickly got off her bike, spoke with the Durango Devo coaches and made her way to the race director’s tent to file a formal protest. Holcomb attempted to make a late pass going into the final flat, but Urist blocked her move. The two riders touched handlebars, and Holcomb got the worse of the exchange. She didn’t crash, but she lost position and was out of the hunt for a state title. After a lengthy review that included written and verbal statements as well as a meeting with both riders, race officials deemed that the result would stand and Urist would keep the state title and Holcomb’s fourth-place finish would hold up. Ruth Holcomb of Durango High School rides in the varsity girls race during the Colorado Cycling League state championship on Sunday on Durango Mesa. Holcomb tried to make a late pass to go into first but finished fourth, a result upheld after a protest. “So, apparently, they said it is my fault because I didn’t complete the pass,” Holcomb said after she was informed of the ruling. “I’m pretty bummed. I felt really strong for most of the race. We were a good pack. It’s kind of a bummer for me that it came down to that moment. Urist said everyone made a challenge during the final descent. “That last lap was crazy,” she said. “Everybody was going for it. We all had the same strategy it seemed like, and it came down to who could do it best. Right until the end, everyone was trying to pass on super sketchy corners. It was crazy. 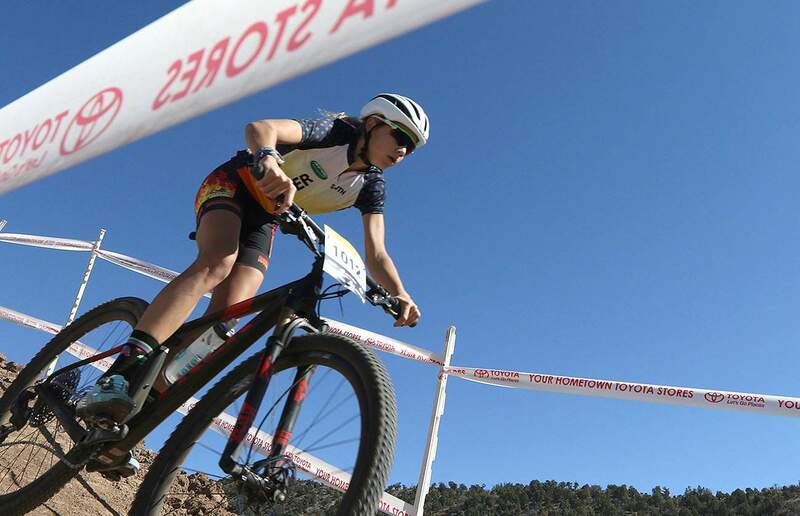 Ruth Holcomb of Durango High School placed fourth in the varsity girls Colorado Cycling League state championship on Sunday on Durango Mesa. She immediately talked to coaches and filed a protest but was unsuccessful. Holcomb scored 547 points for the Durango team and helped send DHS to its second consecutive Division 2 state championship. Durango scored 4,846 points during the weekend and went into Sunday with a 1,500-point lead that only grew after sophomore Aleah Austin completed a season sweep in her division with a state championship ride of her own. Animas High was second with 4,233 points, and Highlander Composite was third with 4,034 points. Boulder won Division 1 with 7,479 points, while Fairview High was second with 6,913 points. Golden was third with 6,426 points. Holcomb, who was the junior varsity champion last year while her teammate Maddie Jo Robbins won the varsity state title, said there are no hard feelings about the race incident, but she will be excited to have Robbins back on the team next year to give her a teammate to work with. 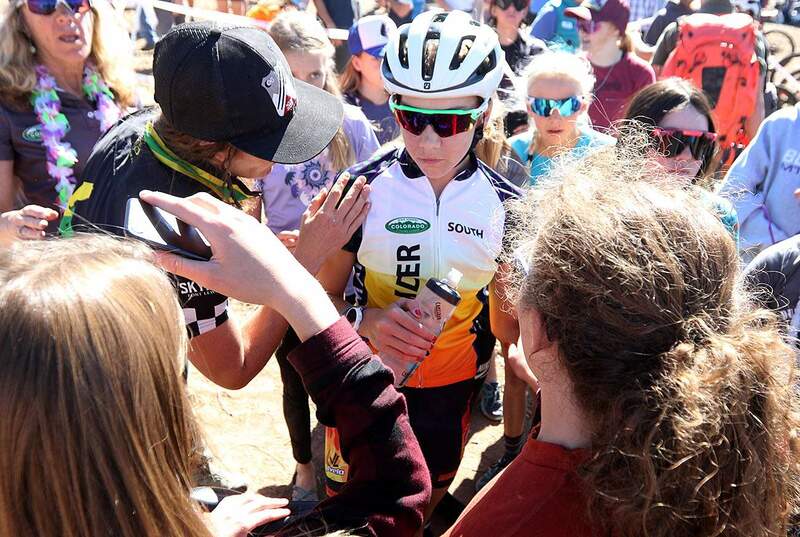 Robbins missed this year’s high school season after she had surgery on her left wrist to repair a broken bone that she raced with during the USA Cycling national championships and UCI Mountain Bike World Championships this season. Ruth Holcomb, left, of Durango High School was all smiles before the start of the varsity girls race in the Colorado Cycling League state championship on Sunday on Durango Mesa. She lined up next to Fairview’s Ada Urist, and the two made contact on the final lap. Urist won the state title after Holcomb’s protest was denied. 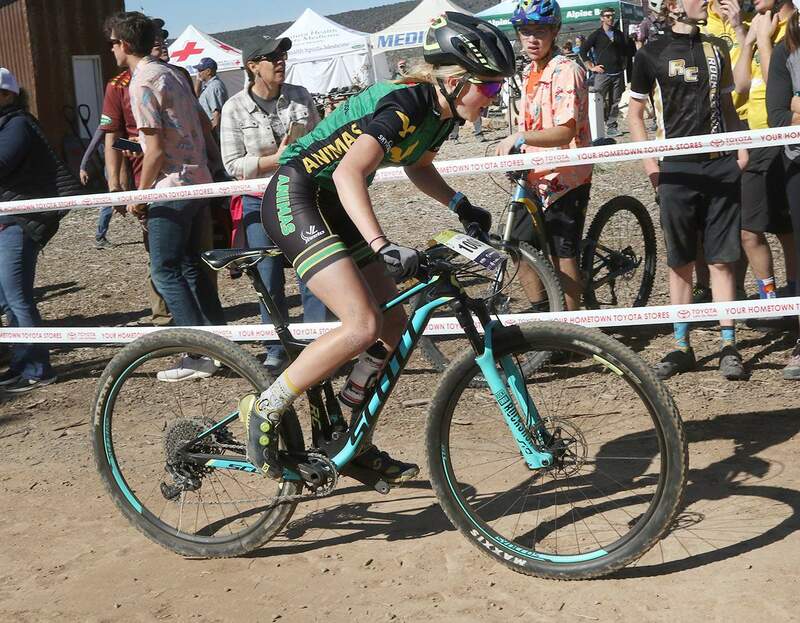 In the 53-girl varsity race, Animas High’s Sage Davis gave a valiant effort and led the race through one lap. The junior went on to finish eighth in 1:38:18.98. Her Ospreys teammate Ce Compton was 31st in 1:45:36.05, and Animas’ Sadie Schafer was 40th in 1:50:11.86. In the sophomore girls race, there was no controversy in Austin’s 14-second win ahead of Battle Mountain’s Harley Blevins. Austin finished two laps of the course in 1:07:34.47 to complete her season sweep with wins in all five races. Austin and Blevins worked together at the front, with Blevins leading on the southern loop and Austin leading the charge on the northern loop. 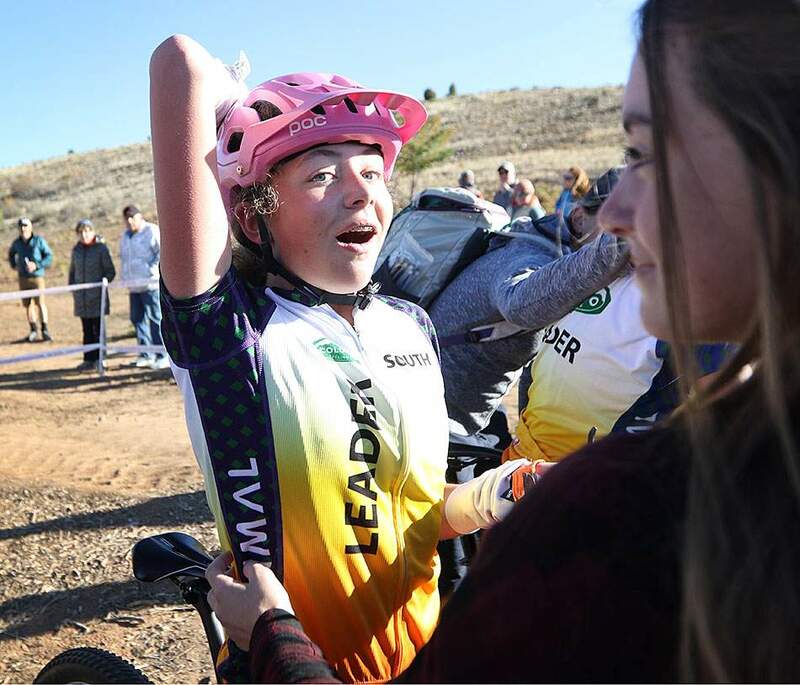 Aleah Austin of Durango High School reacts after winning the sophomore girls Colorado Cycling League state championship on Sunday on Durango Mesa. The 57 sophomore girls were the first racers off Sunday morning. Durango’s Kelsey Nicholson finished seventh in 1:11:16.43, and Durango’s Emerald Murray was 35th in 1:21:59.59. While afternoon riders dealt with heat, the morning racers dealt with a fall chill. After she heated up, there was no slowing Austin. “This was such a fun race with everyone supporting each other and cheering for each other,” she said. “It was a cool thing to watch all weekend and great to be part of. 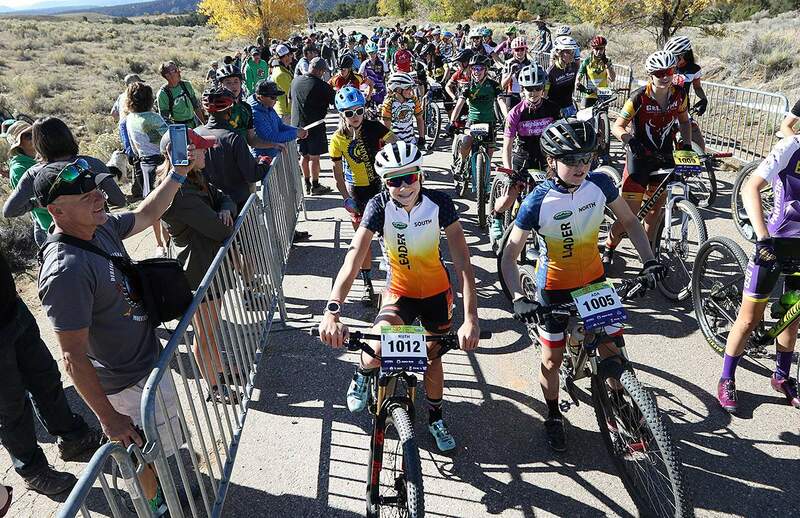 Sunday's Colorado Cycling League state championship races Varsity and sophomore riders battle it out on Sunday during the Colorado Cycling League state championship races at Durango Mesa. 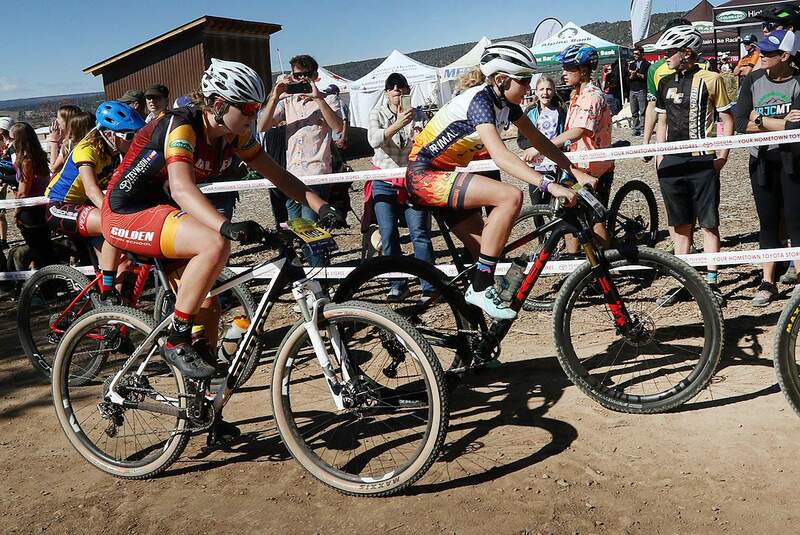 Varsity and sophomore riders battle it out on Sunday during the Colorado Cycling League state championship races at Durango Mesa.